TH E M R EP O RT | 7 FROM THE SOURCE WATCH THIS ∂ FEDERAL OPEN MARKET COMMITTEE PRESS CONFERENCE WITH JANET YELLEN YouTube.com/user/FedReserveBoard Janet Yellen led a Federal Open Market Committee press conference at the Federal Reserve, where she discussed job growth, economic progression, reinvesting proceeds from maturing Treasury securities, principal payments from agency debt, and mortgage-backed securities. To watch her speech, visit the Fed's YouTube channel. SHARE THIS: URBAN INSTITUTE REPORT: "HOME EQUITY PATTERNS AMONG OLDER AMERICAN HOUSEHOLDS" Economists at the Urban Institute investigate housing trends among older Americans, specifically those who are in the ages of retirement. The report discusses how a number of retirees view their home as their most valuable asset, and are able to gain financial security thanks to home equity. The study also focuses on how future generations will save money in order to finance their retirement. TWEET THIS: @ECONOMICPOLICY The Economic Policy Institute is a nonprofit nonpartisan think tank headquartered in Washington, D.C., and covers topics like housing, economic policy, employment, wage growth, and retirement. Since 1988, the Institute has published State of Working America, which provides analytics and data on the economy's effects on the working American. READ THIS: HOW LOW CAN HOUSE PRICES GO: ESTIMATING A CONSERVATIVE LOWER BOUND By the Federal Housing Finance Authority (FHFA) How Low Can Home Prices Go examines theoretical approaches to the decrease in home prices. The book investigates national and state home prices based off a series of statistical techniques that backtrack decades into the housing crisis. The FHFA seeks answers to the downfall of the housing market and inquires about solutions that will affect the future of the housing industry and the economy. M // What are the biggest challenges U.S. Bank faces and how are you addressing those challenges? WIND // With large organizations, the challenge many times is with the people and the culture and keeping everybody on the same page. And I think one of the really great things about U.S. Bank is how we've been able to maintain the feeling of the small company, that intimacy, the real teamwork, and togetherness while at the same time having that large presence. The constant work we have from a management team perspective is how do we make sure we keep that as we continue to grow. M // How has the current regulatory environment changed your approach to mortgage lending? WIND // I think at the most fundamental level, it hasn't changed what we do. We still offer a wide range of products from first-time homebuyer products like FHA, loans for affluent clients, and jumbo loans. So we have that full range. We're in all the channels I mentioned in retail, correspondent, wholesale, and warehouse finance. We're still in all those businesses offering those products. What the regulatory environment has changed is the level of detail that we go through with things. That has impacted the cost to produce loans and the time to get loans closed. What we've been really working through is, what are those things we can do from the process and technology side to get those costs back down again and deliver a great customer experience and shortened cycle times while still meeting regulatory expectations? M // Do you have a mentor who helped you either personally or professionally? WIND // I think one of the great things about being in this business is working with so many good people whether it's people I've worked for, people I've worked side by side with, or people who've worked for me. I'd also say I've probably learned more over the years from people who've worked for me. I'd listen to what they see and what they have going on and that's probably the best way to learn. I was really fortunate in starting the business to work for Marvin Moskowitz, who was truly a visionary around technology and innovation and how that's applied to the mortgage business. M // Various industry reports are predicting a decline in origination volume for 2017. 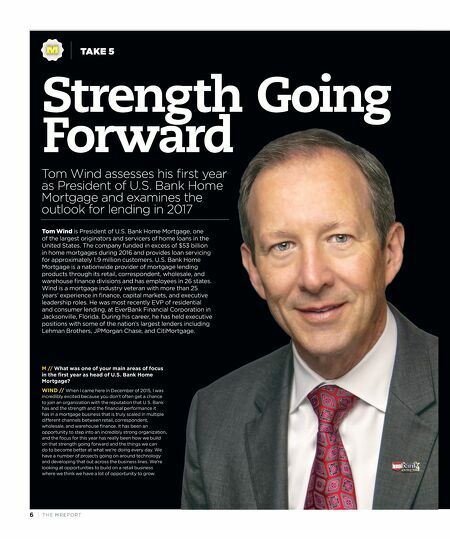 What is your outlook for lending this year? WIND // Rates have spiked up. The MBA's first forecast after the spike in rates showed about a 15 percent decline in volume year over year mainly in the refinance business, somewhat offset by a stronger purchase market. I think that's a reasonable outlook for the environment we're in. I'd also say, we had similar outlooks the last couple years and it hasn't quite turned out that way. We always try to make sure we're ready for whatever comes along, but I do think it's really exciting to see the purchase market picking up. "I think one of the great things about being in this business is working with so many good people whether it's people I've worked for, people I've worked side by side with, or people who've worked for me."